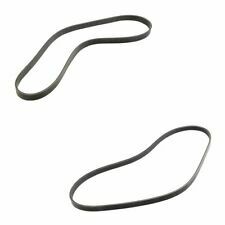 NISSAN PATHFINDER DRIVE BELT SET 1996-2000. 1996-2000 NISSAN PATHFINDER. 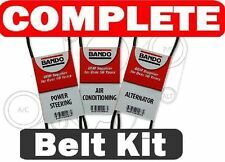 1 Air Conditioning Belt Bando 5PK-1280. 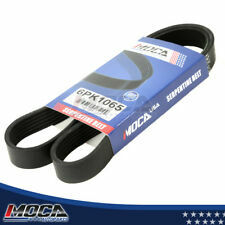 1 Alternator / WP Belt Bando 6PK-1065. 1 Power Steering Belt Bando 4350 / 3340. 1998-1999 Nissan Pathfinder 3.3L 3275CC V6 GAS SOHC Naturally Aspirated Veh; AC; MFI. 1 Serpentine Belt. This Item Includes Car Application：. You may also like. ICE SCRAPER/SNOW BRUSH/SPADE. LAND ROVER. 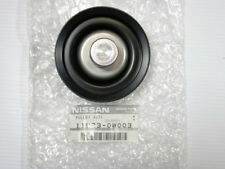 Genuine Nissan Replacement Parts & Accessories! "Dorman Crankshaft Pulley --. DORMAN CRANKSHAFT PULLEY. Condition : New. Therefore all implied warranties that may apply to your part are limited to the duration of this written warranty. Each warranty gives you specific rights, and you may have other rights which vary from state to state. "AC Delco Accessory Drive Belt --. Condition : New. Engineered to strict OE specifications for perfect fit and longevity. Therefore all implied warranties that may apply to your part are limited to the duration of this written warranty. 1996 Nissan Pathfinder SE 3.3L V6. 1997 Nissan Pathfinder LE 3.3L V6. 1998 Nissan Pathfinder 3.3L V6 VIN: A. 2000 Nissan Pathfinder 3.3L V6. 1999 Nissan Pathfinder 3.3L V6. 1996 Nissan Pathfinder XE 3.3L V6. "Gates Serpentine Belt --. Condition : New. Durably crafted for enduring performance ". Therefore all implied warranties that may apply to your part are limited to the duration of this written warranty. See product for application and installation details.". Therefore all implied warranties that may apply to your part are limited to the duration of this written warranty. Each warranty gives you specific rights, and you may have other rights which vary from state to state. Length Each 5060420. Their aramid reinforced EPDM construction is fabricated with the finest materials to ensure exceptional quality and durability fit for high mileage multiple-accessory drives. See product for application and installation details.". Their aramid reinforced EPDM construction is fabricated with the finest materials to ensure exceptional quality and durability fit for high mileage multiple-accessory drives. See product for application and installation details.". "4-Seasons Accessory Belt Idler Pulley --. Notes : 12 V coil type; 3.13 in. belt width. Condition : New. Therefore all implied warranties that may apply to your part are limited to the duration of this written warranty. "AC Delco Serpentine Belt --. Ultra-durable, v-ribbed design efficiently transmits power as needed by serpentine drives. Type : Fan belt. Notes : Fan belt. Condition : New. Made to stringent OE specifications for perfect fit and performance. 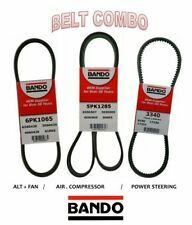 Bando Drive Belt is an essential component of your vehicle that drives multiple engine devices like AC compressor, alternator and power steering. It efficiently supplies power to the steering system, water pump, air pump and alternator. 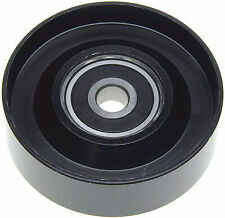 "AC Delco Accessory Belt Idler Pulley --. Condition : New. Bearing made to precise specifications for OE-quality speed and load capacity. Therefore all implied warranties that may apply to your part are limited to the duration of this written warranty. Part Number: 5060420. Established in 1959! Part Number: 5050505. Established in 1959! "Gates Accessory Drive Belt --. Condition : New. Durably crafted for enduring performance ". Therefore all implied warranties that may apply to your part are limited to the duration of this written warranty. Part Number: 89134. Established in 1959! "Gates Drive Belt --Gates Automotive V-Ribbed Belt. 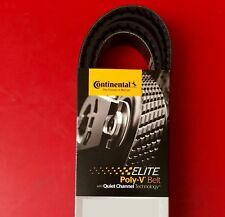 Type : Serpentine belt. Condition : New. Therefore all implied warranties that may apply to your part are limited to the duration of this written warranty. 5PK1285 Rib Ace Precision Engineered V Ribbed Belt Serpentine Belt. 6PK1065 Rib Ace Precision Engineered V Ribbed Belt Serpentine Belt. Belts produced from a mold process will not achieve the exact rib profiles that are required by OEM suppliers. "OES Genuine A/C Belt Tensioner --. OES GENUINE A/C BELT TENSIONER. Condition : New. Therefore all implied warranties that may apply to your part are limited to the duration of this written warranty. "4-Seasons Accessory Belt Idler Pulley --. 4-SEASONS ACCESSORY BELT IDLER PULLEY. Condition : New. Therefore all implied warranties that may apply to your part are limited to the duration of this written warranty.